The BJP today ridiculed Prime Minister Manmohan Singh’s “Rozgar Badhao and Sarkari Kharcha Ghatao” slogan terming it as a “public ruse” and an example of “contradictory policies”. Union Minister of Civil Aviation Praful Patel seems to have decided to bypass all norms and regulations in his bid to upgrade the interiors of 14 aircrafts (Airbus and Boeing included) of the public sector Air-India which would cost the airlines a whopping over Rs 405 crore. Prime Minister Manmohan Singh’s breakfast menu card was being designed in such a way so that food for thought remained a central theme along with other food items when he met Cabinet colleagues and important personas in coming weeks. With the discovery of at least a dozen missiles from a roadside in Bulandshahr district of Western Uttar Pradesh yesterday within days of a factory blast, investigating officials were of view that lethal weapons might not have found their way into the imported iron scrap by mistake but could have been concealed there to be recovered later by a international cartel of illegal arms dealers. The Assam Chief Minister and a Congress stalwart in the state, Mr Tarun Gogoi, is seemingly emerging as a burden for the party President, Mrs Sonia Gandhi. The killing of 49 persons in different parts of Assam and injuring over 150 by ULFA and NDFB militants the past five days has put a question mark on Mr Gogoi’s ability to control insurgency. Its dependence on Left’s support for survival of the UPA government notwithstanding, the Congress has decided to queer the pitch for the Left Front government in West Bengal. The party is coming out with booklets on the Left’s “misrule” in the state in the past 27 years, including “killing of 11,000 Congress workers by political goons”. Former president of the Samata Party Jaya Jaitley today lashed out at Union Minister for Law and Justice H. R. Bharadwaj and demanded an apology for his reported comments that a “private person staying at the residence of the then Defence Minister George Fernandes was carrying out defence deals”. Although Water Resources Minister Priyaranjan Dasmunshi today assured President A.P.J. 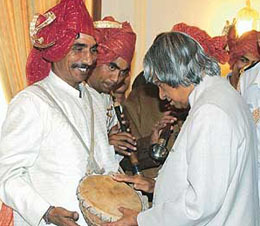 Abdul Kalam that the UPA government had not abandoned the river-linking project, its implementation appears an uphill task. Laying down guidelines for courts below for adjudicating sensitive matrimonial matters, the Supreme Court has said marriages should not be lightly dissolved and plea for divorce should be accepted only in extreme circumstances. In what may just be the tip of the iceberg, a shocking story of a girl trapped in a tantrik net has come to light. A quack in the garb of a tantrik absconded after the police learnt that he was allegedly abusing a college student sexually for over a year. The police have held the man’s relative for interrogation. New Delhi, October 6 The agriculture ministry today launched a farm campaign to increase the rabi yield in a move to make up for the shortfall in kharif foodgrain output. A violent clash between the police and supporters of a labour leader held Firozabad, a city famous for its bangles, to ransom for well over four hours yesterday. Angry protesters held two police stations under siege, set five city buses on fire while several agitators were injured and railway traffic was disrupted for well over two hours. The CBI has arrested three persons on charge of leaking question papers of the Indian Navy’s Matric Entry Recruitment in Ranchi. The Central Advisory Board on Culture has been constituted by the Centre under the chairmanship of Culture Minister S Jaipal Reddy to evolve a participative process of decision-making by taking into view various ideas from different aspects of culture. A senior journalist who went missing from his house in Hardwar was found murdered on Monday. The journalist’s driver, Rajiv, and his former driver, Soni, have been held in this connection. India today asked the International Police Organisation (Interpol) to take urgent steps to ensure quick extradition and deportation of the fugitives wanted in cases of terrorism. The Communist Party of India (Marxist) today said the US Ambassador’s offer to investigate the bomb attacks in Assam was a direct “interference in the internal affairs” of the country. President A P J Abdul Kalam today stressed the need for holding more festivals like “Phool Walon Ki Sair” for promoting communal harmony and national integration in the country. India's moms get set for Mrs World pageant. Party Vice-President and spokesman Mukhtar Abbas Naqvi said on the one hand the Prime Minister was talking of increasing employment and on the other hand his government had “consigned to the cold storage programmes and policies of the Vajpayee government which aimed at providing direct and indirect employment to lakhs of unemployed in the country”. “It has never happened that a government can give fillip to employment by scuttling ongoing programmes of the earlier regime which were giving good dividends in employment field”, Mr Naqvi said and put a question mark on the UPA government’s proposal of an employment guarantee scheme for which a Bill had been promised in the winter session of Parliament. Asking the government to spell out the source of the funds which would ensure employment, the BJP leader said the Prime Minister’s declaration to reduce government expenditure carried no conviction as there was a minister without a portfolio and another minister has a ministry but no work which cost the national exchequer crores. Mrs Sonia Gandhi was not only enjoying the status of a Cabinet minister but also her secretariat was larger than and more expensive than that of the Prime Minister’s Office, Mr Naqvi pointed out and added that the UPA government had promised to constitute more than a dozen commissions which would entail crores of rupees as expenditure. Giving details of the employment generated during the tenure of the Vajpayee government, Mr Naqvi sought to justify the party’s assertion that the UPA’s promise of employment guarantee was not feasible. Mr Naqvi also challenged Mrs Gandhi and NCP leader Sharad Pawar’s statement that the NDA government did “too little” for Maharashtra and gave figures of resource allocation from the Planning Commission to the state during the 9th and 10th plan period. The aircraft, which have been identified to undergo the refurbishment of interiors, have the air-worthiness of between five to 10 years. Apparently, a full-fledged study has also been conducted with regard to the upgradation which would be carried out in the aircraft, but none of the Air-India Board members seem to have seen it. The matter came up at the Air-India Board meeting held last month but the item on the agenda did not carry any feasibility study report for the board members to have a look at. As a result the board did not give its clearance for the upgradation which resulted in complications in the Ministry of Civil Aviation. The documents available with The Tribune point out that at the 101st meeting of the board, held on September 13, the matter for the upgradation of the interiors was listed as item No. 12. It also clearly mentioned that a “study” had been conducted to justify the unscheduled expenditure of over Rs 405 crore. However, the same was not annexed for the board members to evaluate the proposed upgradation of interiors. Sources in the ministry said since the board did not give its nod, the minister’s ire fell on the Additional Secretary and Financial Adviser, Mr V. Subramanian, who has been transferred to the Ministry of Rural Development. Nobody knows what exactly the study is or whether any detailed study was actually conducted, the sources pointed out. Incidentally, the item clearly says that the economic life of the aircraft was between five to 10 years. The economic life of eight A 310-300 Airbuses was five years and that of six B747-400 Boeing was 10 years, the sources pointed out, adding that no cost benefit analysis appeared to have been undertaken for justifying the expenditure. “During presentations given to the minister and the Secretary, Civil Aviation, this issue had come up and it was suggested that Air-India should go in for complete upgradation of its owned fleet,” the memorandum said. The expenditure involved revolves around seat refurbishment and cabin interior upgradation for eight Airbus aircraft. For the six Boeing aircraft, permission was sought for the replacement of existing economy class seats with new seats, making provision for inflight entertainment systems with audio video on demand, Internet and phone facility for all passengers including personal monitors, upgradation of the cabin interiors and replacement of existing galleys and toilets. What comes as a surprise is that a sum of $ 1 million has also been requested for the payment of consultation charges and certification fees to Boeing and Airbus. It was informed during the board meeting that no budget provisions for the current year had been made till the issue was brought before the board and that a budget provision of approximately Rs 100 crore shall be got approved at the time of getting the revised estimates by re-appropriation during the current year. Asked about such a sum, Air-India finance department officials, on conditions of anonymity, said at least they were not aware of the head out of which there were sufficient savings to be re-appropriated for such a big sum. While the memorandum sought the board’s approval for undertaking such an overhaul, it has not been mentioned anywhere as to what gains would accrue out of such an exercise which would keep aircraft out of operation for sometime. Various national issues would add spice to the dining table along with bread and butter and other breakfast items as Dr Singh had decided to hold morning meetings with his Cabinet colleagues individually. The ministers who will be calling on Dr Singh in the next few days were Human Resource Development Minister Arjun Singh, Agriculture Minister Sharad Pawar and Defence Minister Pranab Mukherjee, sources in the Prime Minister’s Office (PMO) said. While the decision to hold such an exercise was taken after the Prime Minister’s luncheon meeting with young MPs last Sunday and a meeting over breakfast with Railway Minister Laloo Prasad the following day, sources said that Dr Singh was actively thinking of finding suitable time slots for interaction with Cabinet colleagues and other important personas. Recently, the Prime Minister also met Left leaders over breakfast. The one-on-one meetings with individual ministers were aimed at discussing the performance of their departments and finding solutions to specific problems and issues relating to each ministry. Dr Singh was likely to discuss with them the overall performance of the government and matters relating to the implementation of the National Common Minimum Programme (NCMP), particularly the issues relating to employment, poverty alleviation, agriculture and economic growth. The move would also prevent individual ministers from announcing policy decisions without consulting the Prime Minister. Dr Singh had recently appealed to his Cabinet colleagues to refrain from doing so. Just a day after the plea, Mr Laloo Prasad had announced a massive recruitment plan to provide employment for 84,000 persons in the Railways. The government had also faced embarrassment over Planning Commission hiring consultants from the World Bank and other multilateral agencies. The consultative committees had to be finally scrapped following objections from the Left parties. The meetings would also serve to find ways to implement the recommendations of the National Advisory Committee (NAC), headed by Congress President Sonia Gandhi, who is also Chairperson of the UPA. NAC reviews the implementation of the NCMP. Senior police and intelligence officials probing the initial blast in a Shahibabad factory, which had claimed 10 lives last week, said that the fact that only the missiles were found abandoned indicated that the persons involved in the racket had done so to avoid detection because of the increased security checks in the area. The abandoning of the rockets and missiles also indicated that the persons involved were aware of the illegality of the operation and had a fair knowledge and training of handling such sophisticated weapons. “ Had they been innocent, they would have waited for the experts to check the consignments, “ a senior official said. The discovery of such a large number of missiles and rockets from the iron scrap had caused panic in the official circles here. Had these missiles and rockets been thrown into smelters the ensuing blasts would have razed most of the Shahibabad industrial area to the ground. Police and the intelligence agency officials had now started verifying antecedents of all employees of the steel factory and the transport company, the Tughlaqabad Inland Container Depot and the firm responsible for importing the iron scrap. The role of officials of the Customs and Excise Department responsible for clearing the consignments was also being investigated. Apart from the Uttar Pradesh Police, several Central Government agencies were also involved in the investigations because of the magnitude of the incident. Senior intelligence officials admitted that there was a ready market for such weapons because of the existence of a large number of terrorist and militant organisations operating in Jammu and Kashmir and the North-East. Starved of arms supplies because of the increased vigilance on the borders, the terrorist outfits might have adopted this route to smuggle in deadly weapons in a bid to escalate violence. In fact, soon after Mr Gogoi proposed a conditional ceasefire on September 30, ULFA and the NDFB unleashed terror. The violence has put Mr Gogoi on the back foot because ULFA and NDFB have made a mockery of the state administration by organising 21 attacks, including bomb blasts and gunfire in open market places in the past five days. The violence has also helped ULFA and the NDFB to have a greater bargaining power in the event of any peace talks in future. As if the violence was not enough, Mr Gogoi has further invited trouble by revealing his eagerness to take the help of the Federal Bureau of Investigation (FBI) to investigate the recent incidents of violence and nab the culprits. The US Ambassador to India offered FBI help yesterday in a letter sent to Mr Gogoi. Be responding to the offer positively, subject to clearance by the Union Home Ministry, Mr Gogoi has only exposed his government’s weakness in tackling insurgency. And above all, by making a positive response to this offer, Mr Gogoi, willy-nilly, has also shown “no-confidence” in the Manmohan Singh Government at the Centre in combating militancy in Assam and the North-East. All leading opposition parties in the state like the AGP, the BJP and AASU have not only criticised Mr Gogoi for deciding to accept FBI help but also questioned his moral authority to continue as the Chief Minister as such overtures only confirm the failure of the state government to maintain law and order. BJP Vice-President Dhruba Kumer Baishya said: “Mr Gogoi was compromising the sovereignty of the country by allowing the FBI to interfere into an internal matter of the country”. AGP President Brindab Goswami described the move as “shameful” and demanded Mr Gogoi immediate resignation from the post of Chief Minister. AASU adviser, Samujjal Bhattacharyya described Mr Gogoi as an incapable Chief Minister, adding that he had failed to implement the Assam accord of 1985 to detect and deport Bangladesh infiltrators who had settled here after 1971. The AGP and AASU on the one hand and the BJP on the other are going to launch a “remove Gogoi” campaign soon. The developments in Assam have also provided a perfect launching pad for the AGP and the BJP to stage a comeback by keeping an eye on the next Assembly poll scheduled in 2006. On his part, Mr Gogoi has gone in for a reshuffle in the police. But the move is hardly to make any difference in the existing situation. Even the faction opposed to Mr Gogoi in the state Congress is reportedly planning to approach Mrs Sonia Gandhi soon to remove him as the Chief Minister as his failure to combat insurgency is likely to have a negative impact on the party’s prospects in the state. Striving to regain its support base in West Bengal ahead of the next Assembly elections, the Congress wants to clear any confusion among its workers about the intensity of battle against the Left. Mr Salman Khurshid, Congress general secretary in charge of West Bengal, said the Congress relationship with the Left was not of dependence but inter-dependence. “It is because of us that the Left is being heard in the corridors of power,” he said. Mr Khurshid said the Congress workers in West Bengal were being told about “convergence of priorities to keep the BJP away” which had brought the two parties together in Delhi “in democratic interest”. The Congress leader, who recently returned from a visit to West Bengal, said the party would draw the Left Front government into a debate about its performance. “We will bring booklets on that to tell people about the performance of the Left Front government in the past 27 years. We will ask questions about their handling of the panchayati raj, land reforms, agriculture and industry and law and order. We will ask them about 11,000 Congress workers who have gone missing due to violent attacks of the Left Front workers.” The booklets are expected to be ready by November 15, Mr Khurshid said. He said land reforms were initiated by the Congress and the people would be told about the “reality”. Left Front’s policy regarding industry and agriculture was a “recipe for disaster” as it led to the sorry plight of tea gardens and “disappearance” of industry, the Congress leader said. Mr Khurshid said there was a strong demand in the party to bring back the Congress votes which had gone to the Trinamool Congress. He said organisational meetings of the state unit would be held after social interactions during puja holidays. Mr Khurshid was expected visit Durga “puja pandals” between October 21 and 24 after which the party plans to hold its district meetings. With Defence Minister Pranab Mukherjee also functioning as the Congress state unit chief, the party is looking for a full-time PCC chief. Mr Khurshid indicated that a new PCC chief may be elected in the course of the coming organisational elections. “The very least you can do is to tender an apology to me for your unworthy and unwarranted comments on me,” she said in a letter to the Law Minister which she later released to mediapersons here. She said the visit and sharing of public work at a party leader’s house could not be described as staying. “Then how would you describe the presence of your political leader’s political secretary at 10, Janpath. Is he staying at 10, Janpath? Are all party colleagues who visit regularly or have meetings at 10, Janpath, staying there? Besides the fact that the project involves massive funds, the major hurdle that any government faces is of evolving a political consensus on this issue. That getting all the Chief Ministers on board is not an easy task can be gauged from the bitter battle being waged between Haryana and Punjab and Tamil Nadu and Karnataka over river water sharing. In addition to the politicians, there is also a strong lobby of environmentalists who are stoutly opposed to this project. Getting round them could also prove problematic. Even if a political consensus is arrived at, mobilising an estimated amount of Rs 5.5 lakh crore for the entire project, getting all environmental clearances and then implementing it could take decades. The minister apprised the President about the time-bound tasks being undertaken by the Water Resources Ministry towards the implementation of the project. Mr Dasmunshi had met Mr Kalam today specially to brief him on the river-linking project as the President had evinced keen interest in this scheme in his last meeting with Prime Minister Manmohan Singh. Mr Kalam, it is learnt, had been questioned about this scheme by several scientists on his recent visit to South Africa and Tanzania and he wanted to update himself on how it was progressing. There were some doubts about the future of the project when the UPA government came to power. 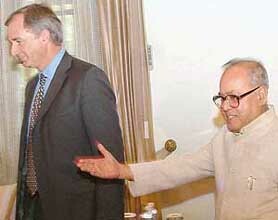 It even provoked former Prime Minister Atal Behari Vajpayee to dash off a letter to Dr Singh to enquire about his government’s stand on this matter. While clearing all doubts on this score, Mr Dasmunshi told the President that his ministry had asked the National Water Development Agency to complete the feasibility report on all 30 links (12 reports are complete) by December 2005. The ministry has constituted a technical consensus group which is to give its report by this month-end. Mr Dasmunshi himself will make a presentation to the Prime Minister on October 11, it was officially stated. He also plans to hold consultations with the Chief Ministers of Uttar Pradesh, Madhya Pradesh and Rajasthan by mid-December to enable the Centre to take up the Kain-Bettua link and the Kalisindh-Chambal- Parvati link on a priority basis. “On the ground of irretrievable breakdown of marriage, the court must not lightly dissolve marriage,” a Bench of Mr Justice S.N. Variava and Mr Justice H.K. Sema said. The court said the ground of “irretrievable breakdown of marriage” should be used for accepting the divorce plea with care only in extreme circumstances. The caution for the trial courts and the high courts for handling such matters with utmost care, came in a case in which a Delhi-based citizen, Shyam Sunder Kohli, had sought to dissolve his 23-year-old marriage with Sushma, alias Satya Devi, for the wife allegedly treating him cruelly and later deserted him. But the apex court said the husband had failed to establish a case of desertion against the wife, as no reliable evidence to this effect were placed on record. “It can hardly lie in the mouth of a party who has been at fault and who has not allowed the marriage to work to claim dissolution of it on the ground of irretrievable breakdown,” the court said, dismissing Kohli’s appeal against the Delhi High Court judgement, rejecting his plea for divorce. Kohli, who had married Sushma in 1981, had lost a case for divorce in the trial court in 1991. The wife had contested his divorce plea by submitting that she was always “willing” to live with Kohli and continue with the marriage but was forced to leave the house by her husband. He filed an appeal in the high court against the trial court order and a single-judge Bench allowed his petition for divorce. This was challenged by Sushma before the division Bench of the high court, which restored the trial court judgement. The tantrik, Baba Karim Khan, who was operating from his office at a movie hall in the heart of the city, fled before a police raid last night. The girl’s family had reported the matter to the police. The man had called the girl over to his office along with another patient on Monday, when the girl’s acquaintances saw her there and reported it to her family. The girl later told her family that she was being victimised for over a year, the police said. The tantrik reportedly exploited the girl sexually after she went to him looking for a cure of her chronic headache last year, the police said. The girl had learnt about the ‘baba’ from a fellow student, the police said. According to the girl, the ‘baba’ gave her sedative drugs in the first dose itself and sexually abused her, the police said. Not only did he repeatedly abuse her physically over the last year but also blackmailed her into giving him money and threatened to defame her if she opened her mouth, the police said. The police has seized some important documents from the man’s office at Kanak Cinema, the police said. A case has been registered at the Dalanwala police station. The agriculture ministry today launched a farm campaign to increase the rabi yield in a move to make up for the shortfall in kharif foodgrain output. Union Agriculture Secretary Radha Singh told reporters that a massive campaign had been launched which would include advisories through the electronic media on the initiatives to be taken for making up for the kharif shortfall. “It is a huge campaign, wheat farmers are being asked to sow early and harvest early to get around global warming which we feel is there to stay,” she said, adding that sowing would have to commence two weeks earlier when moisture in the soil was suitable for the purpose. “Generally the output during kharif is more than the rabi season but this year the trend will be reversed as based on the weather position we expect a manifold increase in rabi production to 130 million tonnes”, she said. According to the first advance estimates, the kharif foodgrain output was likely to decline by 10.46 per cent to 100.29 million tonnes in 2004-05 from 112 million tonnes last year. Agricultural experts of the crop weather watch group after analysing the agro-climatic conditions in the country concluded that the widespread rains of last week had damaged standing crops in some areas but it was likely to improve the rabi crop production significantly. Besides adding copious moisture to soil, these post-monsoon rains had reduced temperature. This would help the growth of rabi plants, they said. The agriculture ministry had quadrupled the money for providing mini-kits including seeds, to farmers. Directions were also being given to tackle the impact of high temperature on the wheat crop during the grain filling stage in March. Home Secretary Alok Sinha only admitted to some 500 angry protesters sitting on the tracks and pelting stones at the police who resorted to a mild lathi charge to disperse them. The incident was triggered following the arrest of labour union leader Mukesh Yadav under the Gangster Act on Tuesday morning. As soon as the news of the arrest of the union leader spread, thousands of his supporters collected at the main kotwali in the city, demanding his release. They also indulged in arson and damaged records at the police station and burnt city buses. After the police shifted the labour leader out of the kotwali his followers indulged in stone throwing and moved to the railway tracks. As no major passenger train was scheduled during the two-hour period the railway schedule did not go completely haywire, informed Mr Sinha. The Commissioner and the DIG, Agra, are camping at Firozabad to monitor the situation. The arrests followed a raid conducted by CBI slueths on a hotel at Ranchi on Monday night, bureau sources said here today. The recruitment, which was scheduled for Tuesday and Wednesday, was cancelled after the arrests. A large number of candidates were found in the hotel room along with the three accused. The room was booked in the name of one accused, CBI sources said. Preliminary investigations revealed that the trio had enticed the candidates to seeks their help to ensuring success in the test, they said. Kapila Vatsayan would be Vice-Chairperson of the board, which would have a three-year tenure. Other members include Mrinal Miri, Adoor Gopalakrishnan, Shyam Benegal, Ramachandra Guha, Yashpal, Ayyappa Panikkar, Ranesh Ray and Mohammad Amin. The Secretary, Culture, would be Member Secretary. According to an official spokesman, the board would advise the ministry at the policy level to evolve programmes, which would focus attention on the variegated creativity at different levels and in different regions in the country, which had been either neglected or not sustained through the existing institutional mechanisms. A senior journalist who went missing from his house in Hardwar was found murdered on Monday. The journalist’s driver, Rajiv, and his former driver, Soni, have been held in this connection. Mr Ram Prakash Tiwari mysteriously went missing from his house in Devpur on Monday, the police said. He was later found murdered in a stream of the Cheela forest range. A Former president of the Hardwar Press Club, Mr Tiwari was living alone while his wife, a cancer patient, was away visiting relatives. The two drivers reportedly got together to kill the journalist looking to take possession of the money he was to get from selling his farmhouse, the police said. Interrogation revealed that the two took the journalist from his place in the afternoon and killed him hours later before dumping the body in the stream. CBI Director and Interpol India Chief U S Misra stated this at the 73rd General Assembly Session of the Interpol in Cancun, Mexico, a CBI press note said here today. Intervening during a session on terrorism, Mr Misra lamented that lack of political will and legal procedures did come in the way of speedy extradition and deportation of wanted fugitives and suggested that the Interpol should take up this issue vigorously. Several member countries supported India’s stand during the session. Mr Misra is leading a five-member delegation - which includes police chiefs of Andhra Pradesh and Uttaranchal S R Sukumara and Kanchan Bhattacharya and CBI Joint Director Ashwani Kumar - to the Interpol, which has 182 member countries. The party also strongly criticised the state Chief Minister, Mr Tarun Gogoi, expressing willingness to accept the offer. “This action constitutes the gross violation of norms and a direct interference in the internal affairs of the country,” the CPM Politburo in a statement said, reacting to the US Ambassador’s offer of FBI assistance for investigating the bomb blasts in Assam. Armed robbers looted over Rs 2 lakh from passengers on the Himgiri Express and injured three persons near Hathidah railway station on the Patna-Kiul section of the East-Central Railway in Bihar today. Stringent action will be taken against the officials found guilty in the Hardwar traders-police clash at the Ardh Kumbh mela five months ago, Chief Minister N.D. Tiwari said on Tuesday after receiving the report of the judicial probe committee commissioned to look into the incident. During the Ardh Kumbh mela in April, violence broke out in Hardwar after one person was killed and many others were injured in police firing. The police fired at a mob protesting against the alleged misbehaviour of two policemen with a local trader’s wife. Even as the violent clashes continued, curfew was clamped in certain parts of the city. Twelve cops were suspended after the incident. One day after he rushed to hospital for a routine check-up, Shiv Sena chief Bal Thackeray said he was quiet fit and would address two public meetings in Mumbai and Thane on October 9 and 10. Mr Thackeray (78), has had to cut back on his political campaign after ill-health for the coming Assembly elections. Mr Thackeray made his statement in his party mouthpiece, “Saamna”, after he underwent a routine check-up at a city hospital yesterday. He complained of pain in his food pipe after he underwent an endoscopy. “By God’s blessings and well wishes of scores of Shivsainiks, I am hale and hearty”, Mr Thackeray said.